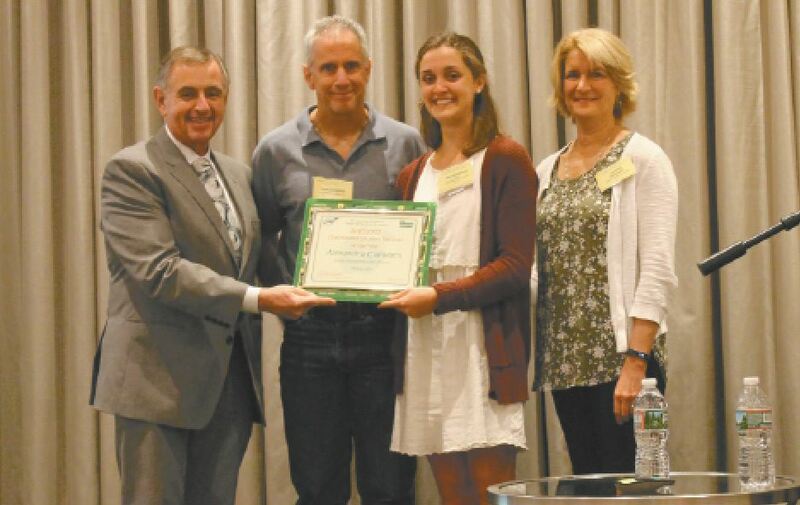 Courtesy photo Hollis Brookline High School senior Alexandra Campbell, flanked by her parents, Stew and Camille, accepts NRRA’s Outstanding Student Recycler of the Year Award from NH the Beautiful board member John Dumais on May 23 in Manchester. EPSOM – The Northeast Resource Recovery Association, New Hampshire the Beautiful and NRRA’s School Recycling CLUB presented Alexandra (Allie) Campbell with their Outstanding Student Recycler of the Year Award at the eighth annual School Recycling Conference on May 23 at the Radisson Hotel in Manchester. Campbell presented the keynote address at the School Recycling Awards luncheon. She outlined the crisis of plastic waste and her steps to implement a plastic film recycling program in her town. Her success translated into over a ton of plastics collected over 18 weeks. Instead of going to a landfill, this resource will now be used to make new products. Nine awards in total were given out. For nomination details on each recipient, visit www.schoolrecycling.net or Facebook page https://www.facebook.com/school.recycling.